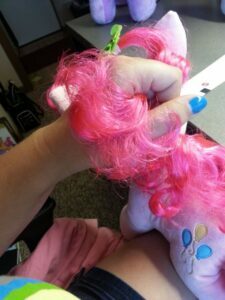 Edit 7/2/14: I’ve had a couple requests for help when it comes to terribly tangled manes – and now I have a tutorial for that! You can find it here! First things first, you’ll want to pick up a wig brush (or at least a brush with metal bristles) and some wig detangler. 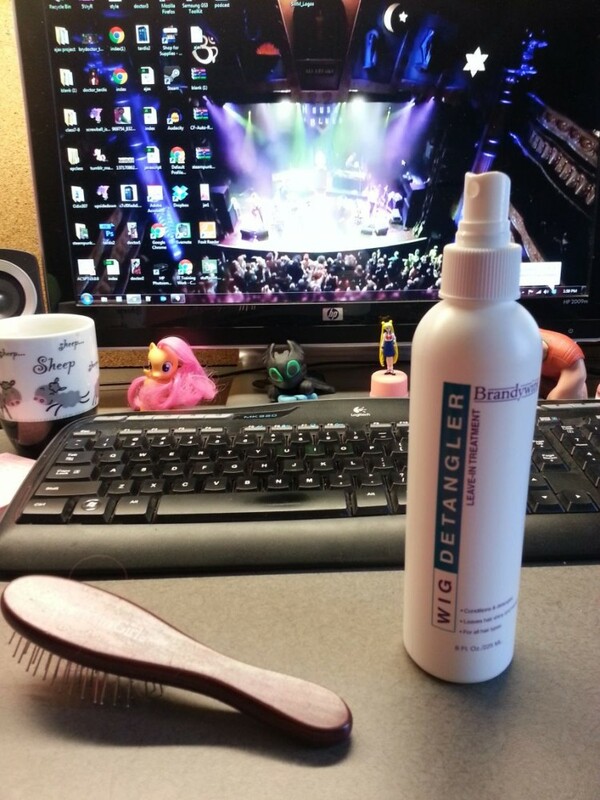 I use an old American Girl doll hairbrush, and recently picked up some Brandywine Wig Detangler off of Amazon for detangling the wig that goes with my Pinkie Pie costume. Have a look at Pinkie’s mane – I’ve brushed it a small amount at this point, but you can see it’s still kinda messy – even for Pinkie! Pinkie after a little bit of detangling – but not much. So, let’s start with detangling Pinkie’s mane. As you get started, you’ll want to work with the hair in sections – if it’s easier for you to do, split it off into little handfuls with ponytail holders – NOT rubber bands, they’ll snag the hair and break it when you try to take them out! – and work with one section at a time. Start at the very end of the section of hair you’re working with, and spray a little bit of wig detangler on the ends. Brush the very end bits gently until they’re tangle free, then spray a little more detangler (only a pump or two) on the rest of the section. Work your way through the section of hair carefully, starting at the bottom and brushing larger parts of the section until you can brush from top to bottom with ease. Repeat with the other sections until you’ve finished! The tail is a similar process – mine had kind of bundled itself into a tangly curl-thing, so I sprayed it liberally with detangler and then split it into sections. If you have a really tangled section of hair, spraying it first will definitely help you split it into smaller sections without breaking the strands of hair. Tail after splitting into sections. From there, it’s the same process as detangling the mane – spray the ends, brush the tangles out, then spray a little more and work your way up the section! 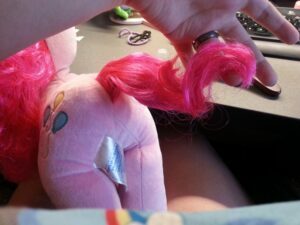 Adding the curl back to Pinkie’s tail. 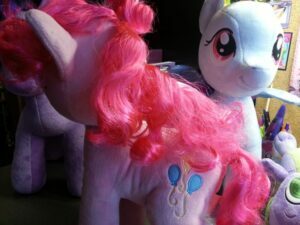 If your tail loses some of its curl, you can twist the tail up into a tiny bun, then secure it with a ponytail holder and leave it overnight – when you undo the ponytail holder the next day, Pinkie’s tail will be nicely curled. You can do the same thing with her mane, if it needs a little more curl – split hair into sections, twist each section into a bun, and then secure with a ponytail! 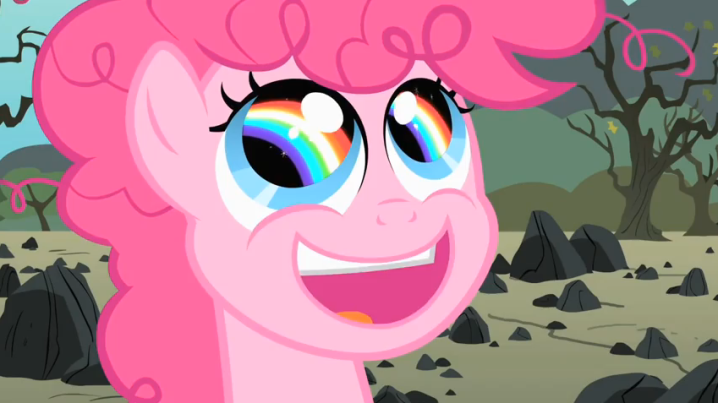 Once you’re done, Pinkie’s mane should look a bit more lively! Next, we’ll go over Rainbow Dash’s hair. Not as bad as Pinkie’s, but still in need of some love. Dashie’s isn’t quite so bad, but there are still some flyaways. Her hair’s a bit easier to deal with, since there’s no curl, and the process is the same. Separate, spray, brush, repeat! 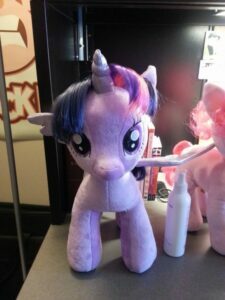 Twilight’s process is similar to Rainbow Dash. 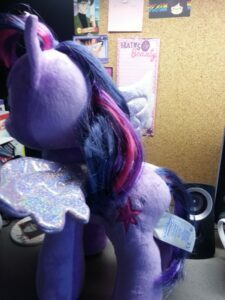 You might also want to spray her bangs with some detangler and smooth them out, to help weigh them down, as Twilight’s bangs are done up in a topknot before they get stuffed and it makes them VERY bouncy. 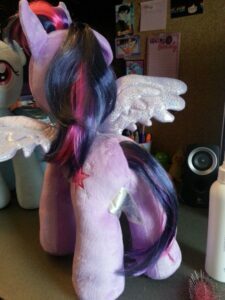 Here’s Twilight’s after shot – definitely better looking than when she got home. It’s wonderful, what a little wig detangler and a sturdy brush can do! Somebody’s a pretty pretty princess! 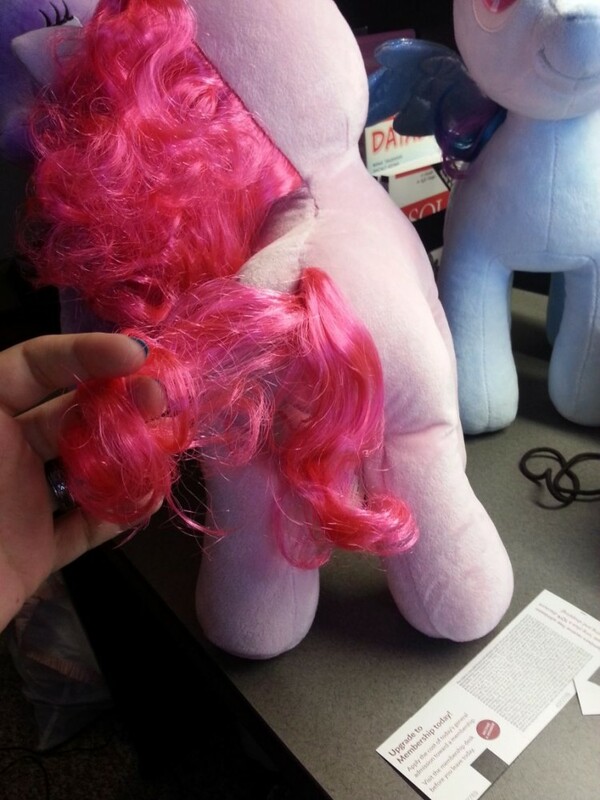 And there you have it – how to detangle Build-a-Bear My Little Pony hair! 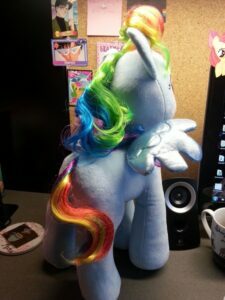 It doesn’t take too terribly long, and makes your ponies look really good! Edit: This post has been featured over on Equestria Daily, and has made this my most popular post yet! This is super helpful, thank you so much! It does work on costume wigs, too – I tried it on my Pinkie Pie wig, which was a snarly mess from last year’s GenCon, and it smoothed out the curls really nicely! Hey guys, I’m having a huge darn problem with my Dash plush from build a bear. It’s hair got super matted and is, even after brushing it out, really snarled and kinked at the ends. I’m kind of loathe to trim the hair, but I’ll do it if I have to — but before I pass the point of no return, does anyone here have any ideas as to how I can de-kink it? Thanks! 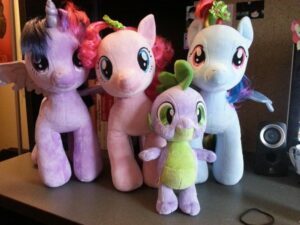 I’ve got the same problem with my Scootaloo plush, actually – I’ve got a couple ideas floating around as to how to fix it without chopping hair off, and if one of them works, I’ll post it here. I’ve heard tales of people using a barely-warm flatiron to smooth out frizzled synthetic wigs, but IDK if it would be safe to do on the hair on these ladies. It might be worth trying, if you’re at the point where you’re going to trim the hair off. Thanks for the help, I just bought Rarity and from snuggling her a bit, her mane in now a bit tangled. I Just Found This and couldnt be happier! My kids pinkie pie and fluttershy have seen better days so I will give this a try! It took me HOURS on each pony, to detangle their mane and tail hair. I know it will be tangled again very soon. My granddaughter loves her ponies but boy, they should come up with a better hair. 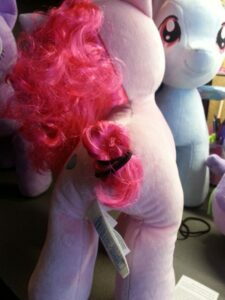 There is no way Build a Bears-My Little Pony mane and tails should get soooo messed. Very, very hard to even separate into sections. One new pony started tangling by day 5!! 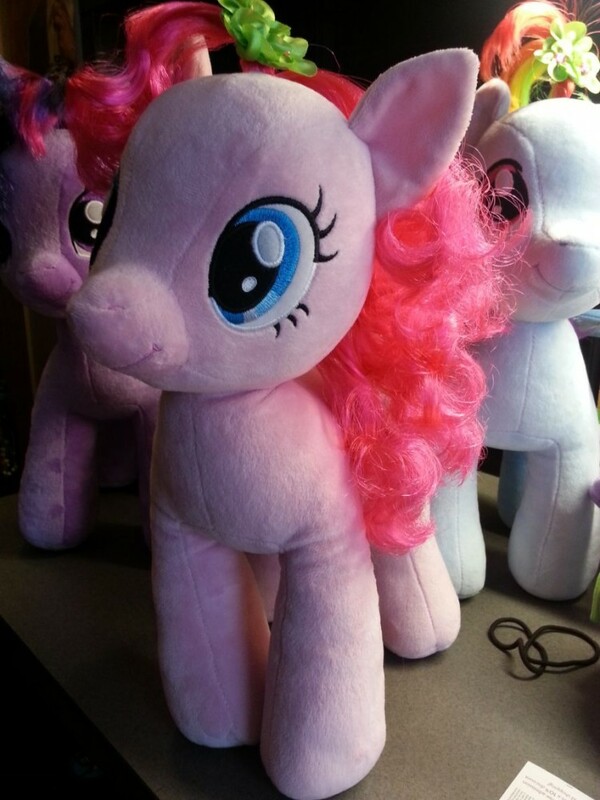 These ponies are expensive and it is the 21 century–Build a Bear should be using better hair. My dolls hair 50 years ago didn’t even get this bad. Barbie dolls don’t either!!!! We need something to be done. Well, dolls and barbie dolls aren’t slept with or cuddled as much as a plushie or stuffed animal so you can’t really use that as an example. 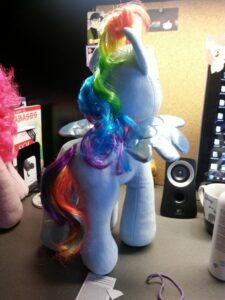 though I do agree that the mane should either have been fabricated or stuffed. Though on the other hand I enjoy brushing my pony’s mane regularly as part of my routine. My advice is to actually let your granddaughter brush her pony’s mane everday regularly to just connect and relax. If you brush it regularly it’s actually kind of relaxing. Does this work on the Honey Girls stuffed animals from Build a Bear too? My princess luna plushie is the best now! I followed your advice about a wired comb and it worked, though I haven’t used the detangler though. I’m only going to use the detangler as an extra precaution, but I will use it soneday soon, at this rate of unconditional love. I love my princess luna plushie. Thank you for your advice. Thank you so much for this. I have just bought my daughter a whole bunch of pre-loved bab ponies and their manes and tails could all do with a bit of love.